Demolish the opposition with this awesome new blaster from Nerf. Load up with Elite darts for motorised blasting to send the competition running for cover. In case that ain't enough to make you king (or queen) of the block, unlease big missiles using pump action. And if you're feeling totally epic, launch both at once! 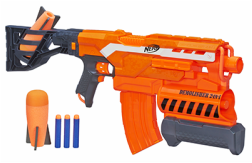 Simply dominate the battlefield with the Nerf Elite Demolisher 2-in-1 blaster, new for Christmas 2014. The Elite Demolisher: one type of ammo just isn't e-Nerf! Experience the excitement, energy, and attitude of the Nerf brand, and find out why it's Nerf or nothing. Nerf N-Strike Elite blasters from Hasbro deliver the ultimate in blaster performance for your Nerf blaster battles, with upgraded distance and the revolutionary Elite dart. Take aim with the Nerf N-Strike Elite Demolisher 2-in-1 blaster and unleash motorized dart blasting and pump-fire missiles! Check out these classic Nerf blasters from the past(ers).